GSA, or Gender and Sexuality Alliance, is a school organization whose goal is to promote a safe place for LGBTQ+ students to support each other and educate others about the LGBTQ+ community. It is an impactful group that facilitates the formation of friendships and alliances among students and faculty. Many schools have a GSA, in some form or another. 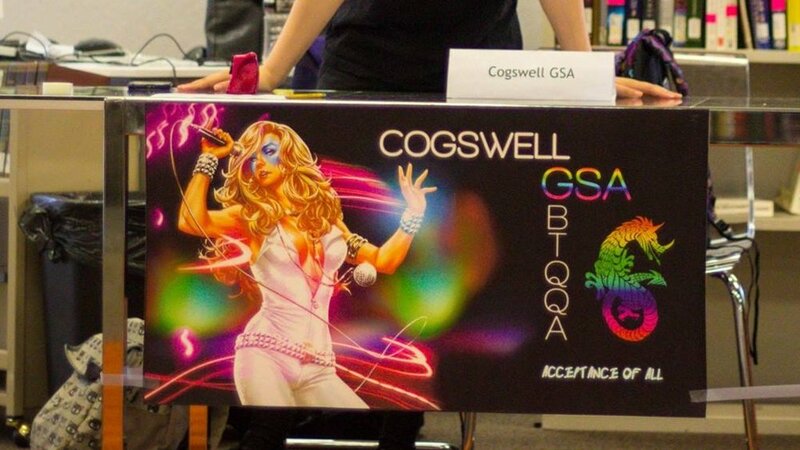 However, historically speaking Cogswell’s GSA has long struggled to maintain a strong presence on campus, despite its potential for being a well-established organization. Over the past few years, GSA has been a rollercoaster in terms of presence at Cogswell, and currently it seems to have faded into the past. One of the main issues with GSA at Cogswell, is student leadership availability. Students are willing to attend meetings when they can, but few are available often enough to run the group. “It used to be a club,” says Brittany Bogle, Dean of Students. “There were a lot of students engaged in it, but they were too busy.” Unfortunately, many of them didn’t have enough time to keep GSA afloat by themselves – which is why the “new” GSA would now be a school organization rather than a club. Since GSA was a student-run club, faculty could only exist as advisors, and had little control over governance, or the fate of GSA. Student availability isn’t the only challenge GSA has faced. According to Brittany Bogle, “there was some general club-student conflict, and so it kind of dissolved and went away.” Freshman Catherine Dievendorf reports that during high school, their school’s GSA also experienced internal conflicts. “There was a lot of drama,” they* say. “Unfortunately, only for about three months was it really successful, and then it kind of fell apart.” Although this was a statement made about a high school GSA club, Cogswell’s GSA could not evade factionalism and dissonance either. Furthermore, GSA may still be having a hard time getting off the ground today because people simply aren’t aware of its relaunch. Only two students attended the interest meeting on October 5, 2017. It is unknown whether or not GSA will regain its prior popularity, but students need to know it exists before it can regrow. Student Services Coordinator Gisi Thompson mentioned, at the interest meeting, that once GSA has regular scheduled gatherings, she will send a schoolwide email to all students to spread awareness of the organization. Hopefully these messages, along with general word of mouth, will encourage more students to get involved. GSA did have its upsides a few years ago, before the club dissolved. The group held many events, such as movies, conventions and career services presentations to inform students about jobs at LGBTQ+-friendly companies. “The smaller and simpler the event, honestly, the more success we had with them,” says Henry Kalenda. Activities where the goal was simply to forge friendships and bonds were the most effective, because GSA is all about making friends in a safe environment. The staff would also hold weekly “check-in” meetings that would offer more support and opportunities to express concerns, which students seemed to enjoy. “We recently had staff attend a ‘Safe Zone’ training so that presentations can be offered to students, faculty and staff. I think those things will become more frequent,” Bogle added. Despite a tricky past, there is still hope for GSA at Cogswell. During National Coming Out Week in the Fall 2017 semester, the LGBTQ+ Youth Space presented a panel of LGBTQ+ individuals to talk to students. The panel was more successful than the GSA interest meeting that had taken place just days beforehand, and attracted the attention of a fair number of students. It was informative and engaging, and panel-goers were able to discuss concerns and ask questions about the LGBTQ+ community. Rafael Joseph, a student at Cogswell and one of the club officers for the Concepts of Animation Club, was one of the panelists He discussed resources available to LGBTQ+ students, including GSA and LGBTQ+ Youth Space. While the GSA interest meeting was small, it was optimistic. Gisi Thompson presented the plan for the future of GSA at Cogswell to the attendees. In terms of immediate objectives, the goal is to establish a presence on campus and form student leadership. In order to create this presence, on-campus programs are the way to go, such as National Coming Out Week (October 9-13, 2017). The aim is to have GSA become primarily student-run in the future. “That’s definitely the goal: to lay the foundation, and then start going from there, and to continue the meetings weekly,” says Thompson. The more students involved in GSA, the more programs the group can start – bringing the school a little closer together as time goes on. The big shift is that the potentially revamped GSA will now be an organization in which Cogswell faculty are more involved. This time faculty can predict availability issues and provide full oversight in case student leaders are unable to attend meetings from time to time. “The hope for most things within student life, is that even if we as staff members recognize the need for it, we also are willing to change the direction based on what the students say they need. [...] We don’t have a fully solidified direction because we would like feedback from the students who want to be involved,” says Brittany Bogle. Having faculty more engaged in GSA will also encourage alliances between students and staff at Cogswell. “It's another thing entirely to have the administration of the school itself coming forward to say ‘you matter, we value your diversity and perspectives, and we want to support you in any way we can,’" mentions Kalenda. The greatest, long-term aspiration for GSA at Cogswell is to establish a safe, long-lasting, purposeful organization for everyone. The existence of GSA in the past, has changed lives and created meaningful relationships for many students. Henry Kalenda reports, “For me, the GSA provided support when I needed it, education I didn't realize I needed [...], and a way to meet friends I didn't need to be nervous about first impressions with.” GSA has the potential to do so once again. Those who were engaged in GSA before it dissolved, are a reminder of how important it is. When asked what they hope to see in a GSA at Cogswell, Catherine Dievendorf says, “a group of people who can get along and have a free conversation, [...] and help people answer some questions.” They* hope GSA is able to educate students who don’t know what GSA is, but want to learn and be involved based on the platform it stands for. Unfortunately, success can’t be pulled out of thin air, and currently there still aren't any students who have stepped up to help lead the relaunch of GSA. People like Gisi Thompson, Brittany Bogle, and the handful of students who attended the first interest meeting last semester understand the time and effort required to rebuild what was lost. Their willingness to work hard makes their commitment even more admirable, and is a testament to their passion for the existence of GSA. However, the truth is that they simply cannot accomplish all that needs to be done by themselves. Although GSA will benefit from the help of Cogswell staff, it is ultimately the students’ responsibility to change the future of GSA at Cogswell.